KARACHI: If there’s one way to describe Fashion Pakistan Week 2019 it was really a mix of convention with the modern. 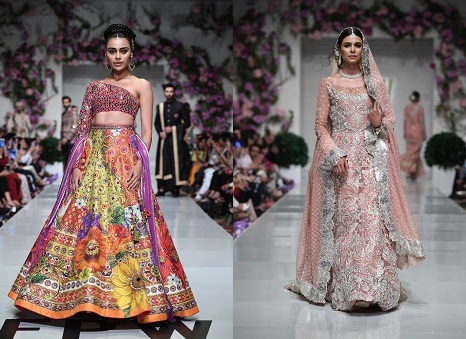 Be it gypsy-styled look of Sana Safinaz bridals or Nomi Ansari’s spectrum of colors and cuts, the three-day affair was a treat to the eyes. After showcasing the wonders of Sana Safinaz through deep reds and blues with occasional splash of pastels and hues, eight designers brought out their creations on the second day. Once again there were colors, florals and extravagance. Generation hit off the show with their ready-to-wear range giving everyone the summer feels with their patterns and lines. Titled #NoNonsenseNighat, the range celebrated the desi culture for all its uniqueness and comfort. Yasmeen Zaman, on the other hand, gave a peek on what destination weddings should look like. Her models sported a whole spectrum of patterns and colors by Van Gogh. Nauman Afreen also played around with funkiness by throwing together embroidered owl motifs with modern cuts and accessorizing them with retro shades. Ideas Pret got a lot of appreciation for their summer collection: cool shades, flowy ensembles and jeweled embroidery stood out among all. The creation was an obvious mix of Mughal Art and Victorian Glasshouse. Another designer who took an interesting approach was Obaid Sheikh. His collection ‘Lost in Forest’ was really what it promised. A wide-array of green and brown shades, the collection was really a walk down a forest. Sana Maskatiya’s range ended the evening on a high note though her impressive designs and beautiful colors. Coming from Pakistan’s history and heritage, the collection had a feel-good aura to it with its subtlety. Day three introduced more bridal work for the summer season in Pakistan. The men’s wear, in particular, brought of basic color shades, classic styles and sleek cuts. But it was Nomi Ansari who wove the magic of his colors, like always. His collection titled ‘Kaleidoscope’ brought out a festive mix of mirror-work on cholis with traditional cuts. Huma Adnan introduced the ‘Monsoon Bride’ that called for modernism and self-celebration all the whilst not compromising on comfort in the summer heat of Pakistan. Showcasing orthodox handcraft in couture style, Zainab Chottani revealed a to-die-for collection. 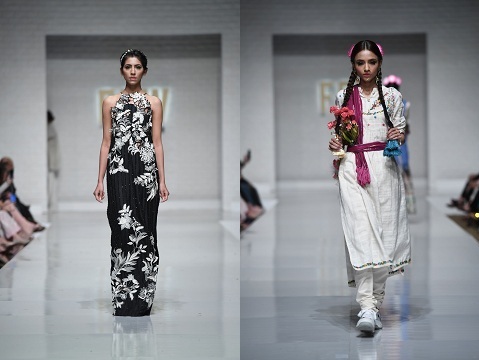 “There was much to expect from this year’s Fashion Pakistan Week Spring/Summer 2019 as it was grander and more international than all previous years. Especially the open spaced venue that made for an ethereal catwalk setting. We had a line-up of many known Pret and Bridal designers from across Pakistan showcasing their creativity in breath-taking ensembles while setting the perfect trends for the festive season,” said Deepak Perwani, fashion designer Chairperson of Fashion Pakistan Council.